Williams made the finals for the first time since 2002. Serena Williams of the U.S. celebrates defeating Italy's Sara Errani in two sets 6-0, 6-1, in their semifinal match at the French Open tennis tournament, at Roland Garros stadium in Paris, Thursday June 6, 2013. 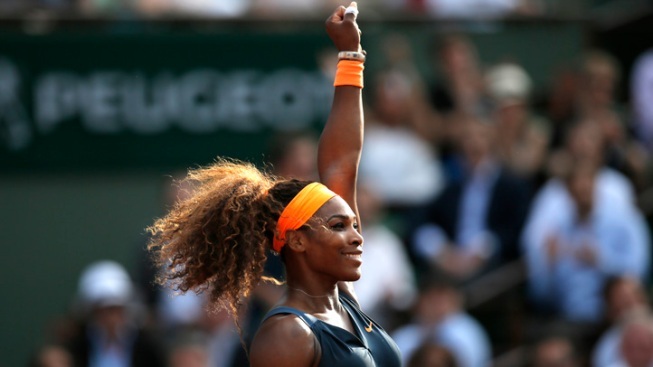 Serena Williams reached the French Open final for the first time since 2002 when she beat Sara Errani 6-0, 6-1 Thursday. The No. 1-ranked Williams' opponent Saturday will be defending champion Maria Sharapova, who defeated Victoria Azarenka 6-1, 2-6, 6-4. Against Errani, the runner-up last year, Williams took control by winning 26 of 34 points in the opening set. The match was 37 minutes old before Errani won a game, and the crowd responded with a roar as the Italian raised her arms in mock jubilation. Williams was undeterred and extended her career-best winning streak to 30 consecutive matches. She improved to 20-3 in major semifinals. The 15-time Grand Slam champion won her only Roland Garros title 11 years ago, beating sister Venus in the final.